No. of Tracks: Depends on the width of the pouch. Multi track form fill and seal is good for oil, shampoo, free flow item packing etc. One can pack, liquide, semi liquide and solid by this machine. 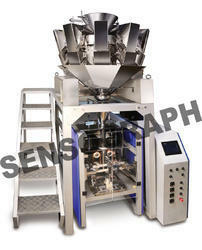 Packing machine for TEA, COFFEE, PULSES, GRANULES, WHOLE SPICES, NAMKEEN ETC. Premium machine with multi head weigher and moveing jaw bag maker. QUANTITY TO BE PACKED: 2gm. to 200gm. MACHINE SPEED: 35-60 Pouch / Min./Track. We offer Auger Base FFS Machines to our clients. The product is made of best quality. Pouch Length: 2"-4", 6"-8", 10"-12", 4"-6", 8"-10"
We are offering Multi Track FFS Machine to our clients.